1) CS55 – The Plantronics CS55 is an all around performer for various environments. With superior digital sound, the Plantronics CS55 professional wireless headset system combines the clarity of traditional corded technology with the mobility and convenience of wireless, so you can walk around your office without missing a call. The Plantronics CS55 has a range of up to 300 ft and was the first wireless headset in the US to implement the 1.9 GHz DECT voice dedicated technology with 64 bit encryption to keep calls clear and secure.The CS55 battery life delivers approximately 10 hours of talk time, and the extended noise-canceling microphone filters out background noise so listeners hear conversations clearly. Both stylish and comfortable, the CS55 includes two wearing styles and can be converted to over the ear or over the head, an optional behind-the-head neckband is also available. 2) CS55/Hl10 – The Plantronics CS55/HL10 “combo” combines the standard CS55 wireless office system along with the HL10 Handset Lifter for one-touch remote answering. With up to 300 ft of roaming, the CS55/HL10 combo will let you answer, end, and mute calls on the headset with the touch of a button while away from your desk phone. 3) CS540 – The Plantronics CS540 is the newest member and version of the CS50 / CS55 family. With a new look, improved performance, and the same rock solid reliability. the CS540 is another Plantronics “CS” model that is headed for the bestseller list. The Plantronics CS540 has outstanding audio quality thanks to DECT technology which provides better audio and eliminates interference from Wi-Fi networks. The CS540 has advanced wideband audio using CAT-iq technology for high definition voice quality, there is also a wideband selector switch on the back of the base when used with a wideband phone system to get the best audio possible. Enhanced Digital Signal Processing (DSP) provides a more natural-sounding voice, while the noise-canceling microphone reduces background noise interruptions, ensuring great audio quality and easing listener fatigue. The CS540 also has a sleek base which takes up less desk space than its CS55 predecessor. And at just around 21 grams, the CS540 is one of the lightest headsets on the market today. 4) CS70N – The Plantronics CS70N lets you communicate in executive-level style and all-day comfort. The CS70N has a lightweight sophisticated over-the-ear design and DECT 6.0 technology to provide office executives with ultra-comfortable, digitally-secure communication up to 300 feet from their desk phone. The CS70N features a top-of-the-line noise-canceling microphone for clear speech in environ­ments with distracting background noise. 5) W740 – The Plantronics W740; one headset for multiple devices. 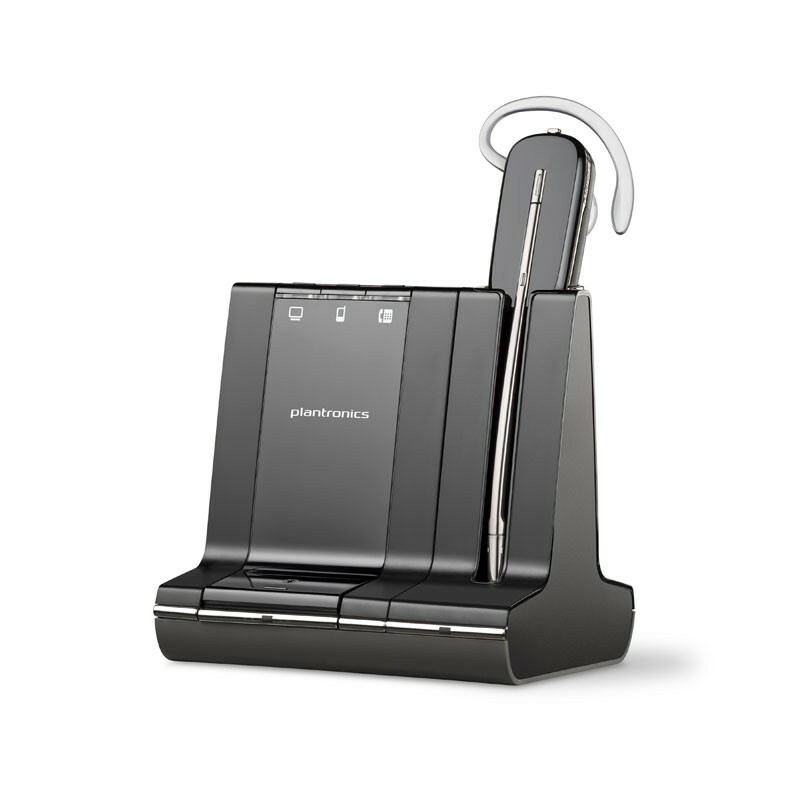 The Plantronics Savi W740 is changing the way productivity-focused office professionals communicate. With the W740’s three-way connectivity, and being optimized for Unified Communications, you can easily manage and switch between your computer, desk phone, and mobile calls from a single wireless headset. This intelligent system combines best-in-class sound quality, hands-free mobility and hours of talk time for ultimate efficiency. The way the Bluetooth portion works is that you can pair your cell phone to the base unit of the W740, so as long as your cell phone is at your desk (or within 33ft), you can answer your cell with the W740 headset. The system automatically routes mobile audio to whichever device you pick up, the headset or mobile phone. The W740 has up to 7 hrs of talk time, a lightweight convertible headset that includes three wearing styles (headband, behind-the-head neckband, and earloops), “hot swappable battery” for unlimited talk time, you can conference in up to three additional headsets, and has a range of up to 350 feet. The W740 is equipped with the latest wideband and DSP technology for premium sound quality and the noise-canceling microphone reduces background noise.